Plaza Linda Vista - Lawrence Thompson Architects, INC. The first mixed use building in Santa Barbara, this 40,000 sf. 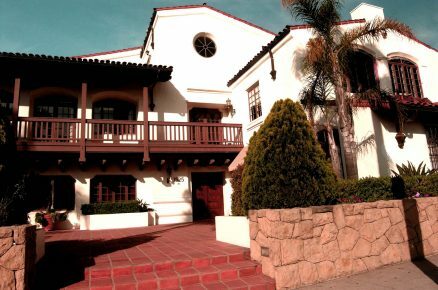 Spanish Colonial building at 1525 State Street was designed with several unique courtyards and a large underground parking garage. Santa Barbara Beautiful awarded the “President's Award” to this project, considered best in review. A certain personality was created by improvising formal archways and balconies with informal wall forms and openings, with towers, winding stairs also adding a subtle rhythm of forms on the walk from front to the large plaza and fountain in the rear.